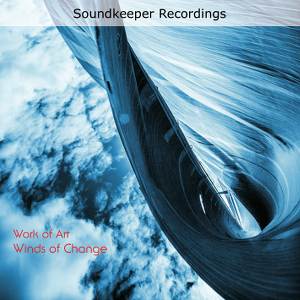 Soundkeeper Recordings - Winds of Change | It's Just Talk! Discussion in 'New Release Announcements' started by bdiament, Nov 26, 2014. Winds of Change, is the follow-up to Lift (http://www.soundkeeperrecordings.com/lift.htm), the album by Art Halperin and his band, Work of Art, that was the very first release on Soundkeeper Recordings. Art's masterful guitar work (both acoustic and electric) soars with his captivating melodies, while the band drives the tunes with creative instrumental support and their rich vocal harmonies. Recorded in a 19th century church, Winds of Change features Work of Art at its best, performing their infectious songs with a joy that can be felt in the listening. The album will ship on December 1 and pre-orders are being accepted now. For those who might be interested, Winds of Change was recorded "live" (for the microphones), direct to stereo, with no overdubs or mixing. Balances were achieved by moving the players and instruments on the stage, instead of moving faders on a console. The performances were captured by a stereo array consisting of a matched pair of wideband microphones. Recorded at 24/192 (24-bits, 192k sampling rate), the result is the best sounding Work of Art album yet, in high definition, with unrestricted dynamics. The goal was to provide the listener with all the cues necessary to give the feeling of being transported to the church, in the presence of the performances. Samples (http://www.soundkeeperrecordings.com/windsofchange.htm#tracks) of the music, and photos and videos (http://www.soundkeeperrecordings.com/windsofchange.htm#sessions) from the recording sessions are now up on the Soundkeeper site. For more background on the sessions, as well as a list of recording equipment, see the Winds of Change entry in the Soundkeeper blog (http://soundkeeperrecordings.wordpress.com/2014/08/22/winds-of-change).